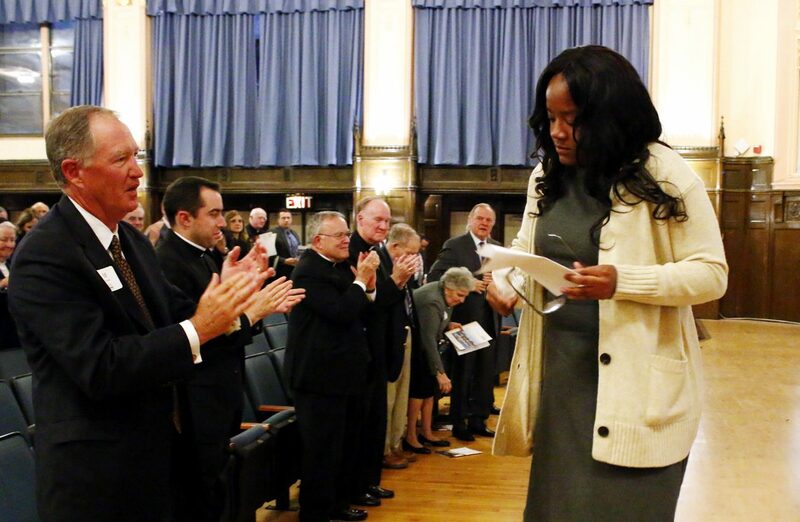 Thanks to foundation’s aid, Catholic schools are ‘saving lives’ in Phila. Faith in the Future, the independent foundation that manages the 17 high schools and the schools of special education of the Archdiocese of Philadelphia, celebrated its four years of operation with an anniversary event on Monday evening, Nov. 7 at West Catholic Preparatory High School with Archbishop Charles Chaput as the honored guest. Invited to the event were the presidents, principals, members of the high schools’ boards of directors, staff of the archdiocese, and donor friends and partners of Faith in the Future. The purpose of the foundation “is to provide a quality and affordable Catholic education for every family and child who desires one,” said H. Edward Hanway, the founding chairman of the organization’s board of directors. It is, he conceded, an increasingly difficult mission but one that is being met, and the proof is the confidence shown by the archdiocese in extending Faith in the Future’s management contract a year and a half ahead of schedule through 2022. No small part of this is oversight of financial aid to students who need assistance. According to the annual report distributed at the event, this aid increased from $10.9 million in fiscal year 2011-12 to $20.8 million in fiscal year 2015-16. Almost half of this was raised through the individual schools and alumni, with much of the balance through EITC and OSTC state tax credits and funds from foundations. That the meeting was held at West Catholic had a certain significance in that West was originally founded 100 years ago in 1916 as West Philadelphia Catholic High School for Boys. The sister school West Philadelphia Catholic High School for Girls came along in 1927. The two combined in 1989 and still occupy the original campus of the former West Catholic Girls. It was only fitting that among the speakers were two alums of West Catholic, one from the past and one recent. Leonard Mazur came to America as a small child with his family who were post-World War II refugees. After graduating from West in 1963 he enrolled at Temple University but his education was almost interrupted for financial reasons. Then a local merchant for whom he worked part time offered to loan Mazur as much as he needed for his college education and pay it back whenever he was able. Mazur went on to a very successful career in industry and in gratitude he vowed to pay it forward. Although West had been recommended for closure in 2012, earlier this year Mazur and his wife Helen gave the school a $5 million gift that will assure its continued existence. “The primary reason my wife and I feel so passionate about the school is because it is a lifesaver. It saves lives,” Mazur said. The next speaker, Jasmine Mays, class of 2016, is a perfect example. A graduate last June with highest honors after holding just about every student office at West, she is now enrolled as a Gates Millennium Scholar at Villanova. After starting with a prepared talk, Mays broke down in tears. “Had it not been for the Faith in the Future Foundation I probably would not have been prepared for college,” she said, describing how after the death of her grandmother she and her mother were virtually homeless. Mays was a hard act to follow, but Faith in the Future CEO Samuel Casey Carter summed up the progress that has been made over the first four years. “We have stabilized the schools financially. Now we have to focus on growth,” he said.